In the first year of New Diplomacy's Eastern Partnership Journalism fellowship, five fellows – three journalists from Ukraine, two from Georgia – were selected. Here is a selection of some of the stories from three of the fellows - hosted respectively by Eastbook.eu. 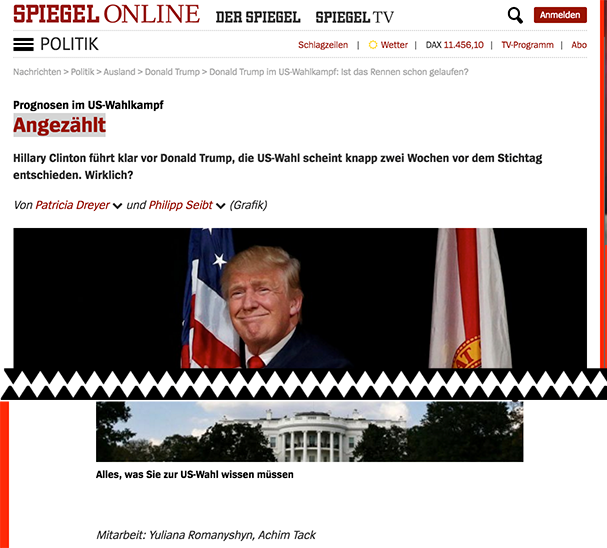 in Poland, and Spiegel Online and ZDF public television in Germany. 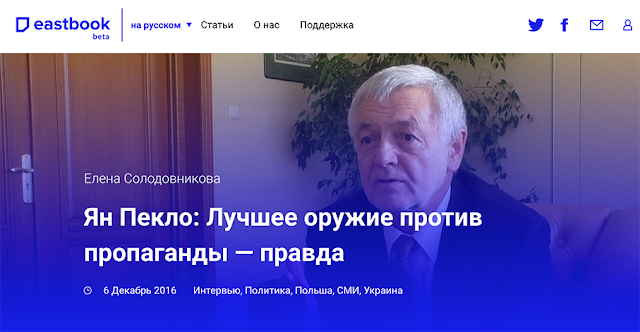 The stories include an interview with New Diplomacy co-founder Jan Piekło just a few months after taking up the position of Poland's Ambassador to Ukraine. 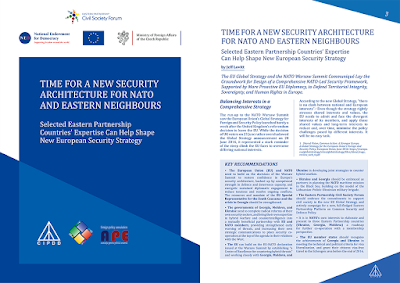 During her fellowship, on 6 December 2016, Eastbook.eu published the following article by Olena: Ян Пекло: Лучшее оружие против пропаганды — правда (Jan Piekło - The Best Weapon Against Propaganda is the Truth). The piece is an interview with New Diplomacy co-founder, Jan Piekło, a former journalist who wrote for samizdat media under communist rule in Poland, and later covered the wars in the former Yugoslavia. Jan, now Poland's Ambassador to Ukraine, explains that the best way to fight propaganda is to report the truth about what is going on in Eastern Ukraine. 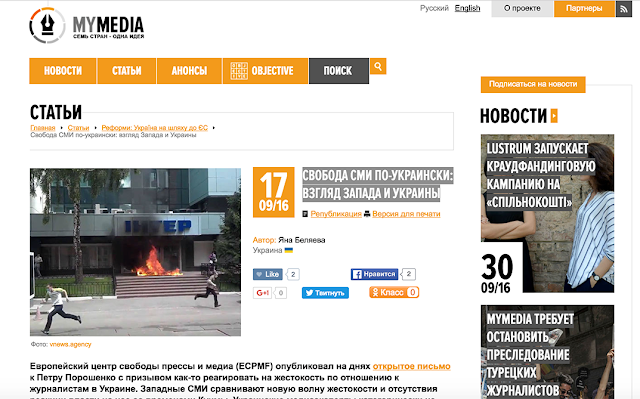 Olena wrote the following piece for Eastbook.eu, published on 22 November 2016: Украинские заложники. Изнанка спасательных операций (Ukrainian Hostages. The Rescue Operations from the Other Side of the Fence), in which she charts the challenges she faced in the harrowing experience of securing the release of her husband, a fellow journalist captured by separatists in Donetsk, Eastern Ukraine. On 20 December, Olena wrote Услышать Силезию (Listening to Silesia) for Eastbook.eu, in which she examines the lessons of the reform of the coal sector in Poland for the restructuring of the energy sector in Ukraine, as the government intends to close a significant number of unprofitable mines and shed thousands of jobs. And there are many parallels between Donetsk, host to Ukraine's coal fields, and Silesia, with its own strong regional identity in Poland. 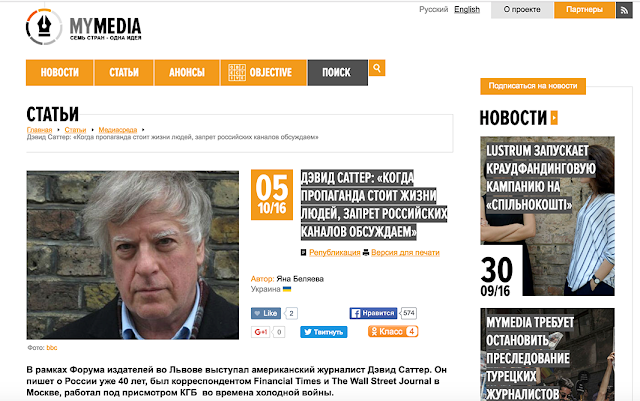 Свобода СМИ по-украински: взгляд Запада и Украины (Freedom of the Media in Ukrainian: The View from the West and Ukraine), published on 17 September 2016, about the conflicting views of Ukrainian and Western experts on freedom of speech and safety of journalists in Ukraine. Дэвид Саттер: «Когда пропаганда стоит жизни людей, запрет российских каналов обсуждаем» (Author David Satter Talks about Kremlin Ban on Him), published on 5 October 2016 - an interview with David Satter, an American reporter for the Wall Street Journal, and expert on Russia and the USSR, about Russian propaganda and media influence in Ukraine and the US. 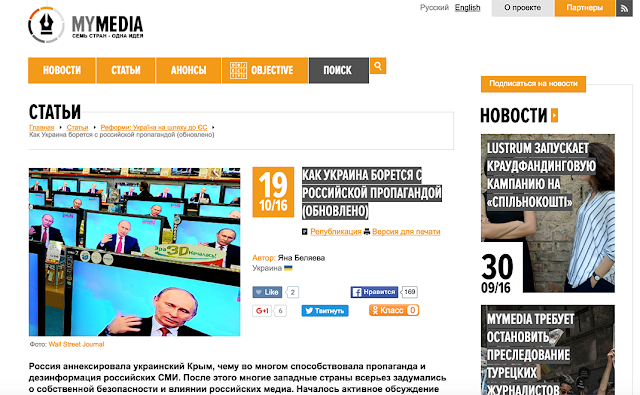 Как Украина борется с российской пропагандой (How Ukraine Struggles With Russian Propaganda), published on 19 October 2016, providing an overview of expert opinion on the methods used in Ukraine to fight Russian propaganda. 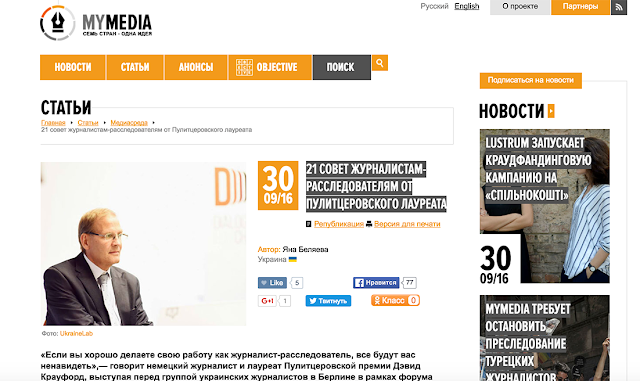 21 совет журналистам-расследователям от Пулитцеровского лауреата (21 Tips for Investigative Journalists from A Pulitzer Laureate), published on 30 September 2016, where David Crawford, who investigated the shooting down of the MH17 flight over Eastern Ukraine, provides advice to local journalists. Crawford has undertaken several big investigations on Russia. Американская журналистка о Трампе в СМИ: «Это как наркомания. На каком-то этапе уже трудно остановиться» (American Journalist about Trump in the Media: "It's Like an Addiction. At A Certain Stage, It Becomes Difficult to Stop.”) - interview, published on 7 November 2016, with Betsy Fischer, an American journalist who produced interviews with top politicians on NBS for 23 years. 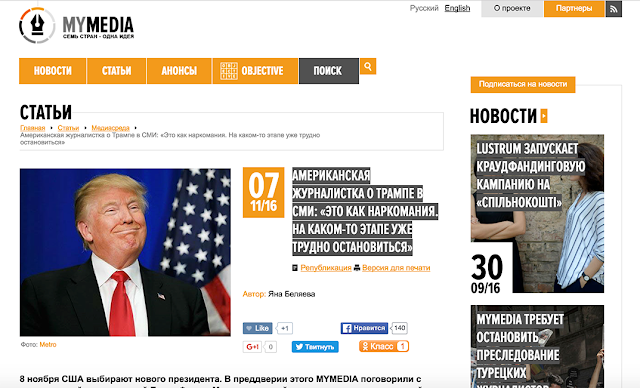 Yana discussed with her the "Trump phenomenon", media standards, and Russian intrusion into the American information space and political system.